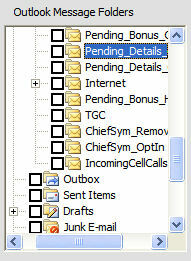 The Folder Tree lists all the Outlook message folders in the same order in which they appear in Outlook. The Folder Tree and the email Message List are the mechanisms through which messages are selected in ArchiveAssist to have their Modified Dates changed or to be deleted. Placing a checkmark in the checkbox next to a folder will select all the email messages in that folder as well as all email messages in all subfolders of that folder. For example, placing a checkmark in the checkbox next to "Personal Folders" - the top level folder in Outlook - will select ALL email messages in Outlook. Placing a checkmark in the checkbox next to "Inbox" will select all messages in the Inbox and all of the Inbox' subfolders, but will leave all the other folders unchecked. Notice that the name of a selected folder, and the number of messages in that folder, is displayed in the status bar below the Folder Tree.